Elmire (Ruth Arnell) is startled by the bold advances of Tartuffe (Nicholas Callan Haubner) in a scene from SummerStage's "Tartuffe." Maybe it was the pleasantly cool late spring evening, Dustin Martin’s direction, a fine cast or great classic script. Or maybe all of it. Whatever it was, opening night of SummerStage’s “Tartuffe” revealed a finely-tuned, high-energy, laugh-filled rendition of Moliere’s well-aged comedy. While SummerStage can sometimes offer a bit of a challenge for the audience to hear all the characters, every word of this delightful farce was crystal clear. And you don’t want to miss a word of Richard Wilbur’s masterfully translated version. Wilbur, a 20th century American poet and pre-eminent translator of French works, has kept the rhyme and wit of Moliere’s play, first performed in 1664. This version contains colorful, clever language and references while the rhythm of the rhyme never seems cumbersome or convoluted but lilting and light … easy on the ears. The play features one of the stage’s most well-known scoundrels – Tartuffe (Nicholas Callan Haubner). What today might be called a street person, Tartuffe was saved by Orgon (Michael Chobanoff), so smitten by Tartuffe’s proclamations of religiosity and goodness, that he’s invited him to stay at his well-appointed home. Orgon’s mother, Madame Pernelle (Maggie Wirth), has also fallen under Tartuffe’s spell. But Tartuffe is perhaps literature’s greatest con man, liar and hypocrite and the rest of Orgon’s family knows it. Yet, trying to persuade their elders seems to bear no fruit. 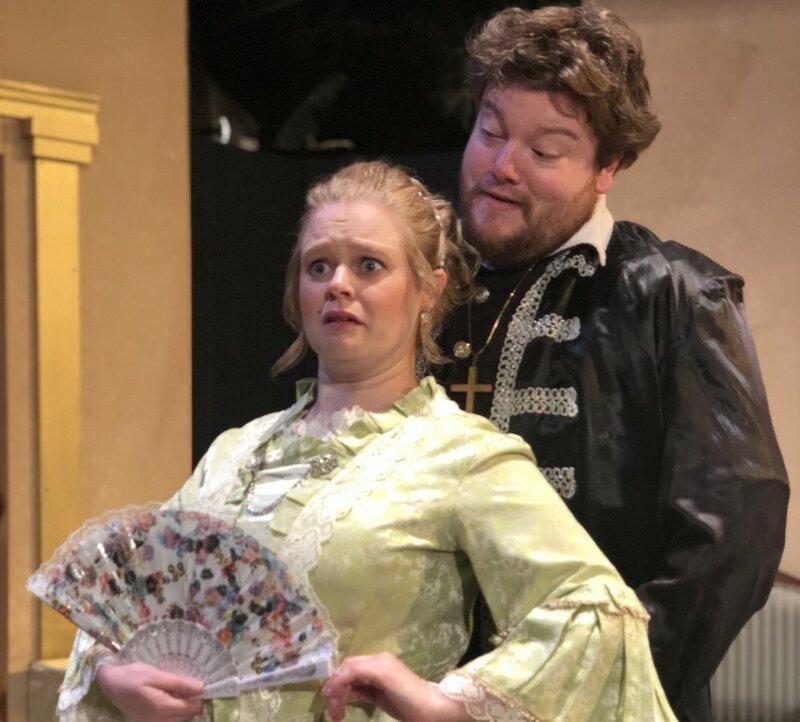 Orgon is so taken by the scheming Tartuffe he has insisted his daughter, Mariane (Kara Penrose) – who’s in love with Valere (Logan Milway) – marry him. Orgon’s even promised his home and possessions to Tartuffe. Orgon’s brother-in-law, Cleante (Matthew Collie), who demonstrates the most common sense, tries to knock some sense into Orgon. Yet, Cleante is so pretentious and snobbish as he rails on about Orgon’s obsession with Tartuffe that Orgon just tunes out. It is one of those great lines that makes your ears perk up, hoping for more of Moliere/Wilbur’s clever dialogue, so well-delivered here. Even when Orgon’s son, Damis (JJ Gatesman), overhears Tartuffe seducing his mother, Elmire (Ruth Arnell), Orgon is not moved. Instead he condemns his son for lying and orders him out of the house after Tartuffe puts on a show of mea culpa that Orgon sees as more proof of his piety. All of this comes in Act I, which is a flurry of activity and motion, despite being so dialogue- heavy. Characters do a marvelous job of expressing with their exaggerated movements, keeping the show flowing at a steady clip. Act II features mostly Tartuffe and Elmire, who attempts to convince her husband once and for all that Tartuffe can’t be trusted. She has Orgon hide under a table during her interaction with Tartuffe in their home. She is to give Orgon a signal when he should come out if Tartuffe has gone too far in his advances. It is a hilarious scene with Haubner, Arnell and Chobanoff getting into the farcical mood to great effect. Will Orgon and Madame Pernelle see Tartuffe differently after his obvious misdeeds? Or does Tartuffe get away with his crimes and – with Orgon’s mansion? " While several-hundred-years-old classics can often get bogged down in monotonous dialogue and stagnant characters, all performers in “Tartuffe” carry on with the vigor and verve of a modern farce. I especially enjoyed Hudziak’s Dorine, who is a whirl of activity and expressiveness, always reacting to the characters around her with comic flair. Haubner captures Tartuffe’s smarmy character perfectly as the ingrate jockeys to find favor in every situation – until his treachery finally catches up with him. Haubner is to be watched even when not speaking, as his changing expressions reveal his thoughts. As Elmire, Arnell adds to her list of fine local performances, handling the language with elegance and the comedy with skill with lines such as “I’ve found that a polite and cool rebuff discourages a lover quite enough.” It wasn’t quite enough for Tartuffe, however. Wirth is also at her comedic best, giving Lady Pernelle a boisterous, commanding presence. I was so pleased to see the smaller parts of Monsieur Loyal and the Officer, near the end of the show, handled so well by Jim Mallmann and John Gelshenen, respectively, allowing the momentum of the fine performances created by the major characters to continue. Hats off to costume designer Claire Tidwell for providing elegant, well-fitting, period-appropriate garb for the characters.